Soccer superpowers that will miss out on the 2018 FIFA World Cup Finals. This chart shows the number of times selected men's national soccer teams failed to qualify for the FIFA World Cup. As the final whistle blew on the 0-0 draw, the tears started to flow. Italy had failed to qualify for the FIFA World Cup for the first time since 1958. After their poor showing in the group stages in 2014, only finishing above a dismal England, the Azzurri now have to come to terms with the end of an era. 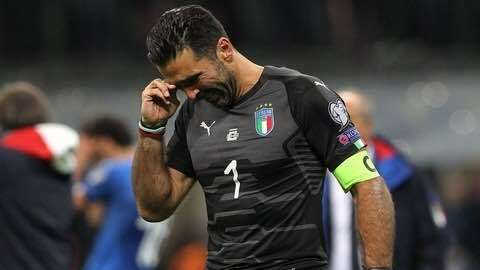 Talisman goalkeeper and 2006 World Cup winner Gianluigi Buffon announced after the game that he is retiring from international football along with fellow members of the old guard, Daniele De Rossi and Andrea Barzagli. It won't help ease the pain felt in Italy, but as our infographic shows, they're far from alone in failing to get to the FIFA World Cup Finals. 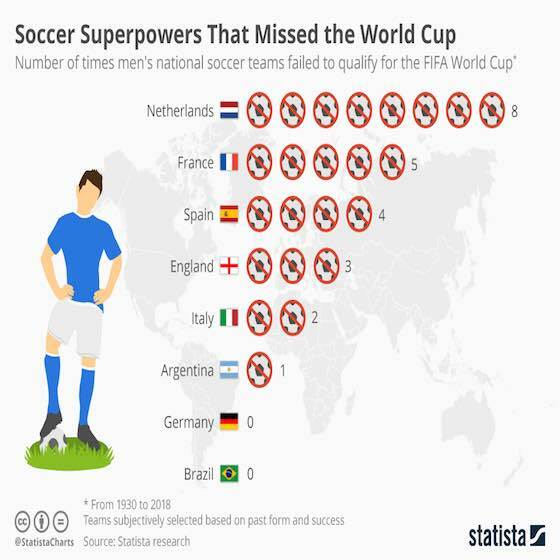 Of the teams that can be safely considered as 'superpowers', the Netherlands top the heartbreak table, having missed out on a trip to the World Cup a total of 8 times -- including the 2018 tournament finals in Russia. Argentina came close to missing out this time round but managed to avoid adding to their 1970 disappointment. Of the eight teams featured here, only Brazil and the current FIFA World Champions Germany don't know the bitter taste of a qualification knock out, having made it through to the finals at every attempt so far. Soccer: "Epic Failures for Soccer Superpowers"